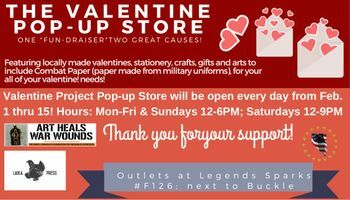 One-stop pop-up shop for Valentine's Day handmade cards and gifts, featuring the work of local artists. Find us next to Buckle, in storefront #F126. Proceeds benefit two local arts foundations, Laika Press and DJD Foundation.